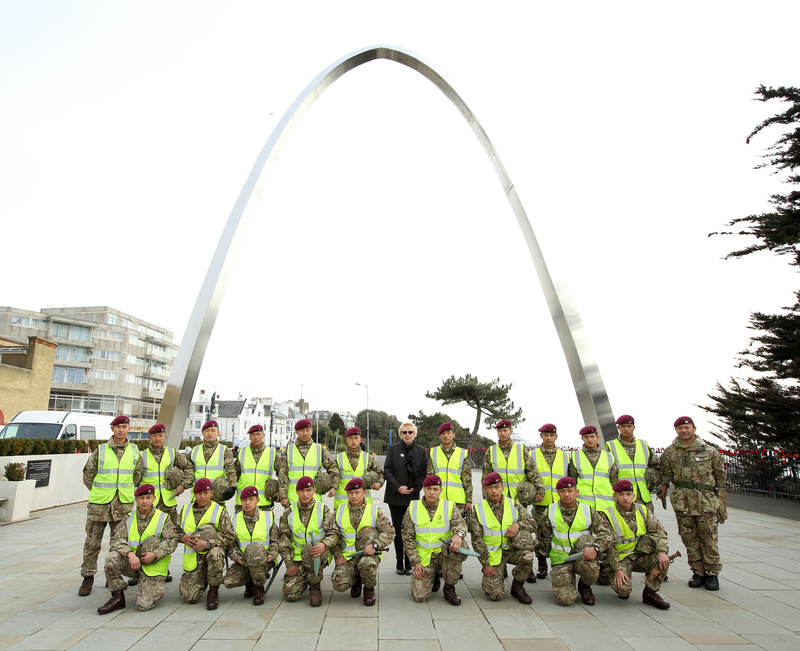 With a biting wind blowing of the sea, soldiers from the 2nd Battalion The Royal Gurkha Rifles (2 RGR) based in Sir John Moore Barracks in Folkestone on Friday 26 February joined forces with the local community to fight Folkestone’s litter. The soldiers shared their military skills to scale the Leas Cliff and fight the blight of hard to reach rubbish on the escarpment. This special ‘Clean for The Queen’ event involved the troop’s climbing down into the undergrowth from the Road of Remembrance, in celebration of Her Majesty’s 90th birthday celebrations. A (Amboor) Company, collected over 100 large refuse bags of litter over a couple of hours, which included office furniture, umbrellas, several traffic cones and a traffic barrier. In the shadow of the Step Short Memorial Arch, Folkestone’s tribute to a previous generation of soldiers, it is humbling to remember that the 2nd Battalion will shortly be serving their county in Afghanistan. Lt Col Jamie Murray, Commanding Officer of the 2nd Battalion The Royal Gurkha Rifles, said: “I’m happy that the soldiers of A (Amboor) Company have the opportunity today to represent the 600 soldiers of the 2nd Battalion The Royal Gurkha Rifles. Community is very important to Gurkha soldiers. Their time and effort today goes a short way to showing our appreciation to the people and council of Shepway District. The support and welcome that are offered to our soldiers and families is valued by every one of us. As we look to send many of our troops to Afghanistan again, the community support to our families becomes even more important. The contribution of local schools, businesses and council services all play a vital role in ensuring families are well looked after, and our soldiers are in the best possible mind for deployment. Since the Gurkha regiment moved to Sir John Moore Barracks in 2001 the Nepalese community has taken an active part in town life; the Folkestone Nepalese Community are regular litter pickers throughout the year, supported by equipment from Shepway District Council’s Community Store. Cllr Jenny Hollingsbee, Shepway District Council’s Armed Forces Champion, said: “Picking up other people’s litter is a small thing compared to military service but both shows the Royal Gurkha Rifles’ commitment to our community. I’d like to say a big thank you to our extraordinary litter pickers today and wish them a safe return from defending our security in Afghanistan.